FREE admission to the Garden on this day includes Butterflies LIVE!, live music from the Happy Lucky Combo, a parade, and more. Open rain or shine! Sponsored by CarMax. Free admission all day 9 a.m. – 5 p.m. This is daytime event only; no fireworks. Open RAIN or SHINE. 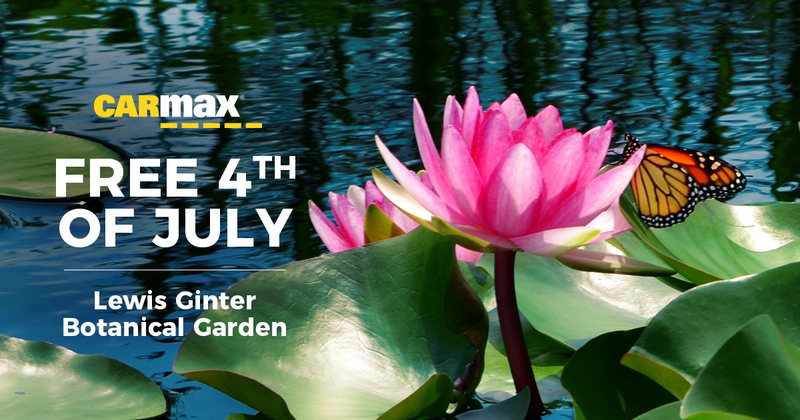 Celebrate CarMax Free Fourth of July by enjoying the gardens, Butterflies LIVE! Wear red, white and blue and bring your wagons and strollers to decorate for a parade in the Children’s Garden. Children can also cool off in WaterPlay. On July 4th, Historic Bloemendaal House will be open from 10 a.m. – 3 p.m. staffed with Garden Guides for informal tours. Originally opened as the Lakeside Wheel Club by Lewis Ginter in the late 1800s, the building has a fascinating history. Stop by and learn more about its evolution! 1. What to Bring: prepare for a warm day! Bring water bottles & sunscreen; wear comfortable shoes and clothing. Lawn chairs and blankets are allowed. 3. Parking: Carpool if you can! Parking is limited and once lots are full, the Garden will close gates temporarily. Gates will re-open once space becomes available. We appreciate your patience; our security staff works hard to ensure everyone’s safety. If parking off-site, please be considerate of our neighbors and do not block driveways. 4. WaterPlay: We have sprinklers in WaterPlay, it’s a great way for kids to cool off. 5. Plan Your Visit: Many people head to the Butterflies LIVE! exhibit first. Please be aware the Butterflies Live! line will close at 3:30 p.m. so that we may get guests through the exhibit by our 5 p.m. closing time. Here’s more info for planning your Garden visit, including accessibility. We’ll have extra Garden staff and volunteers working July 4, so look for us — we’re here to help! Photography of visitors, events and activities at Lewis Ginter Botanical Garden for CarMax Free 4th of July are taken for promotional and editorial use to advance the mission of the Garden. Your attendance at this event implies your consent to display and/or publish any photographs in which your image appears. Guests who do not consent to this policy may opt out of a photo by informing the photographer. These images become the property of Lewis Ginter Botanical Garden. They may be used in any and all Garden publications and media without limitation or reservation, and are not subject to compensation.